1 of 3 In a small bowl, stir together sweet & sour sauce, orange juice and the tapioca. 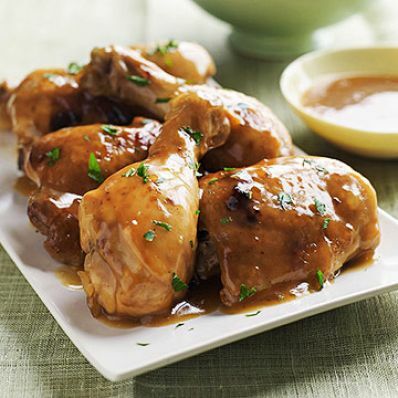 Place chicken in slow cooker bowl and pour orange juice mixture over top. Cover and cook on HIGH for 3 hours or LOW for 5 hours. 2 of 3 Using a slotted spoon, remove chicken to a serving platter and keep warm. Stir salt into orange sauce. Pour sauce into a gravy boat; set aside and keep warm. 3 of 3 Prepare angel hair pasta according to package directions. Drain, return to pot and stir in 1/2 cup orange sauce. Serve chicken with pasta and remaining sauce. Per Serving: 360 kcal cal., 439 mg sodium, 2 g sat. fat, 0 g fiber, 7 g Fat, total, 159 mg chol., 49 g pro., 22 g carb.